Freaky or is this going to be normal weather? 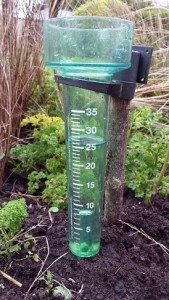 Here is a link to my “freaky weather” article that I wrote on the 11th Feb 2014 and in one part I say, “…just three days ago we had about 35mm of rain overnight from a storm that went on to hit the UK”. Again as I write there is storm brewing in the Atlantic, Storm Imogen. So now up to “I” in the Weather Alphabet. In a change of format, I’ve done my updated rainfall as a bar chart. Showing the data in this way makes it easy to see two things. First is the extraordinary amount of rain we had in December 2015. Not surprising it broke rainfall records for the month. 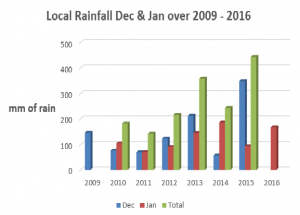 Second, by simply looking at the green bars of the combined rainfall for December and January from 2011 onwards, there does appear to be an upwards trend. Over the timescales needed to be confident in weather trends I’m showing very limited data but there’s no denying that, over the past three winters, things have been getting wetter. If you would like to hear more about how weather and moisture affects our everyday life, please sign up for email alerts of my blogs.